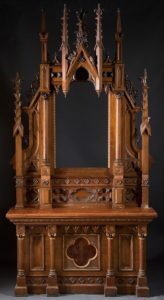 Gothic furniture is a very beautiful, unique type of artwork that exemplifies Gothic architecture at its best. This style is also known as the French style of architecture. Some characteristic features of this bold architectural style are the use of heavy, dark woods, flying buttresses, pointed arches, and ribbed vaults. These elemental designs are also present in gothic furniture just on a much smaller scale. They translate it all as scroll work, or woodcarvings often times present with decorative creatures such as gargoyles and dragons. Gothic furniture can be found all over the world due to its international appeal. You will be able to find this style furniture at any type of specialty store in just about any city. Shopping for Gothic dining chairs or tables can be a very rewarding process because this type of furniture is quite dramatic and ornate. The main consideration to take is scale. If you have a smaller dining room, you do not want to overpower the space with large Gothic renderings. Instead, you should aim for smaller tables and chairs that will better complement the Gothic architecture in your home. There are additional accent pieces you can get in the Gothic style that are quite lovely. Gothic accent pieces can include anything from Gothic bookcases to end tables and candle stick holders. You can accent the beautiful Gothic architecture perfectly with just a few pieces. This is a great way to avoid overpowering the space while giving it that bold, Gothic grandeur affect.